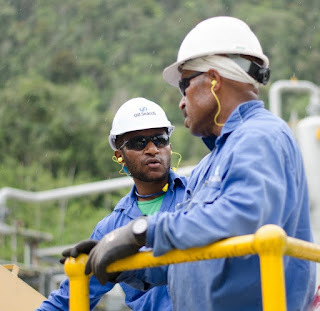 Goshen Kili, aged 24 years from Southern Highlands Province, is one of six Oil Search graduate engineers selected for the Oil Search Graduate Engineering Customised Petroleum Technology Program at the INSTEP Petronas training facility in Malaysia. The new training program is designed to provide industry specific knowledge and gap closure for our engineering graduates, giving them a common inter-disciplinary base to foster interaction among the different engineering specialisations. Goshen graduated with a bachelor’s degree in Mechanical Engineering from the PNG University of Technology and joined Oil Search in 2016. “As a graduate mechanical engineer with the Oil Search Reliability and Surveillance team, I was able to work on several equipment reliability improvement projects which at some stage had me perform the role of project coordinator,” Goshen said. “With such exposure and hands-on equipment and plant maintenance tasks, I was able to build my confidence and develop my skills and knowledge in a culturally diverse working environment. “The graduate development program at Oil Search has given me the best opportunities and now with this new training program, I couldn’t be more thrilled. INSTEP Petronas is a specialised 200-acre oil and gas technical training facility in Malaysia consisting of six academies with training plants covering drilling, oil and gas upstream and downstream facilities. Our engineers cover several disciplines including petroleum, electrical, process and mechanical. It is very important for them to have a common inter-disciplinary base in order to understand each other’s specialities as well as the production and maintenance disciplines. This holistic understanding will enable them to integrate well with the engineering and production teams. Oil Search managing director, Peter Botten, said that an added benefit of this graduate program is the international experience and exposure we can give the graduates at this early stage in their careers. “Realising benefits beyond technical training, this will provide them with enabling skills to prepare them for any future overseas assignments such as work in other engineering offices or facilities as part of their careers with Oil Search,” he said.